YO! Sushi's awesome Japanese food experience! The story goes like this... i received an invite from the Melium Group to attend to a dinner function with them but this time around with the presence of their key members from Aigner. One of the many brands brought down here to Malaysia by Melium Group. So i went to YO! 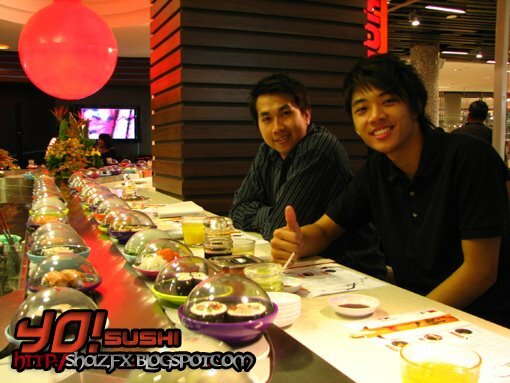 Sushi with Gary & Ian, but was suppose to be there with a few others aswell but they couldn't make it. Not to worry about that... time well spent, food was FRESH and there's absolutely nothing more for me to ask for from that night - company was great aswell! YO! 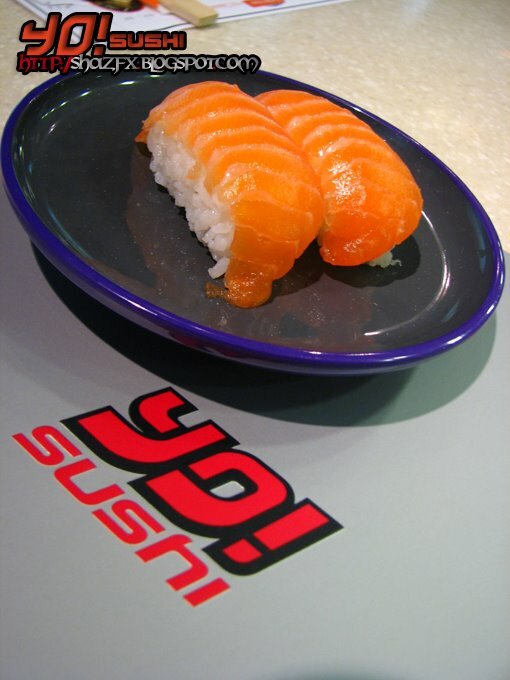 Sushi originated from the UK, now in Malaysia at 2 locations - Pavilion Kuala Lumpur and MidValley - The Gardens. Both outlets brings the same kind of atmosphere and treatment! 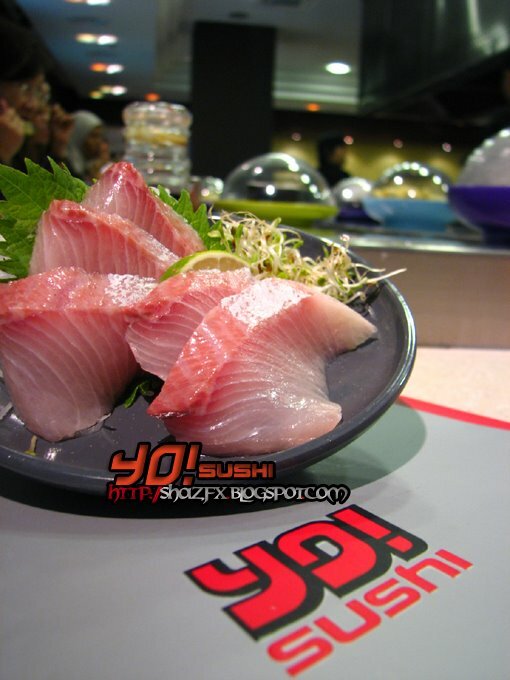 You will LOVE their Sashimi's and Miso Black Cod dish!!! 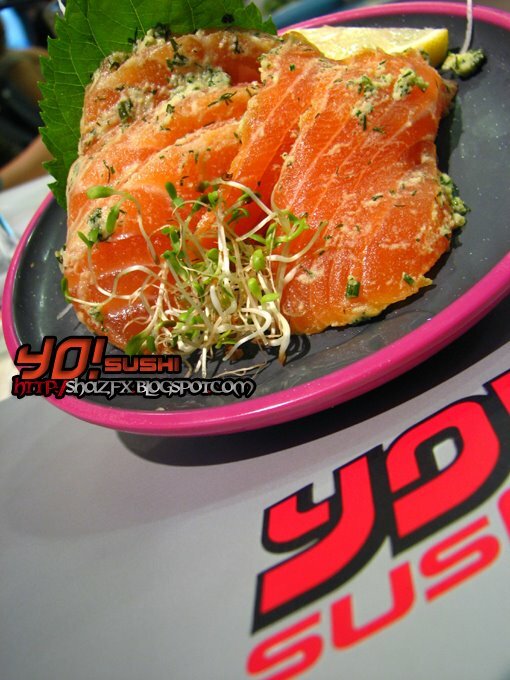 Last last week when i went for the dinner at YO!Sushi for the first time with Melium Group was with Sandra and met up with Shaolin Tiger and Kimberlycun was there too! Anyways more about YO! Sushi later below...at the end of this post! - But for now let's checkout YO! Pictures shall we!!! That's Ian and Gary - we were about to start our meal here tonight!!! We ate a WHOLE LOT of food! The first time i ate so much of raw food ever!!! 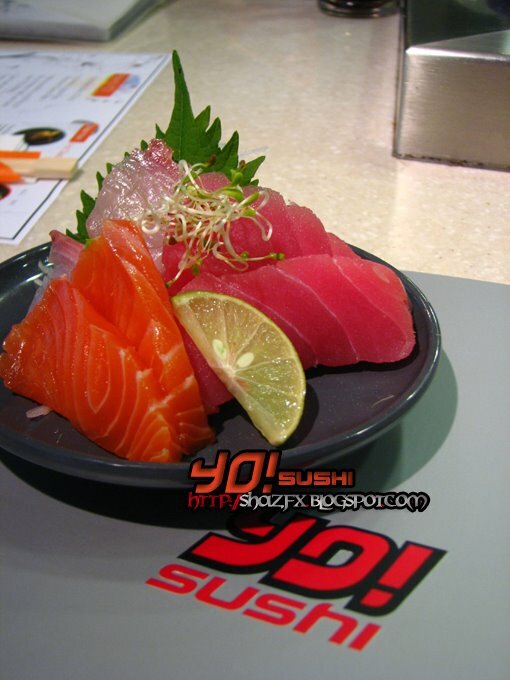 Their sashimi combo - with a mixture of everything! 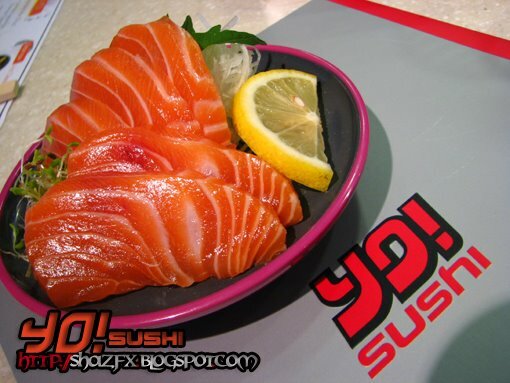 Salmon Sushi... this is as fresh as you can get! This is one of the must try roll!!! 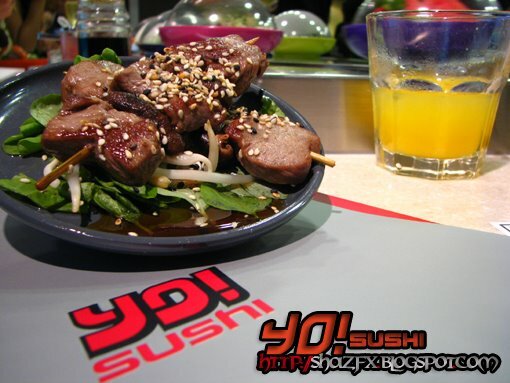 Check it out when you go to YO!Sushi next..! 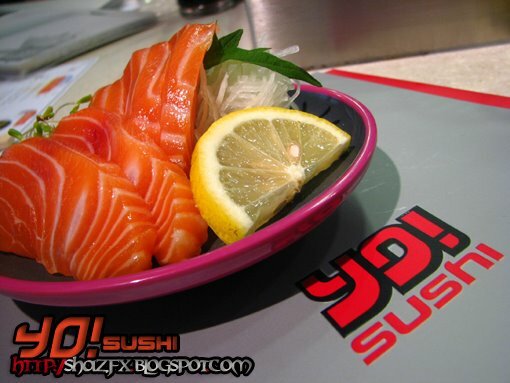 Salmon Sashimi...as fresh as you can get! 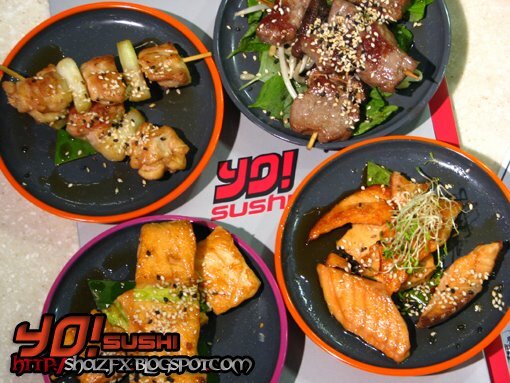 Just flown into the country this morning and straight away delivered to YO!Sushi. Beef Shitake with mushroom...skewered!!! The sauce that covers this skewer is delicious and the taste is even better! I didn't try this out but Ian had this, it was their SAKE! Hehehe... a must try for those who loves JAPANESE Alcohol! A selection of their dishes...all of these came in at once! I had hard time taking photos or wanting to eat!!! This is a MUST TRY as well!!! 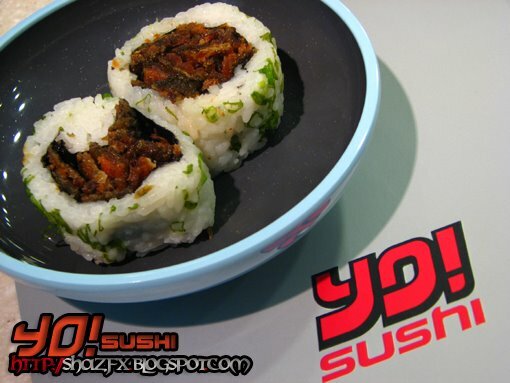 OMG...when's my next trip down to YO!Sushi...let's all go together! Salmon coated with light Wasabi... i tried it, but Wasabi is not my cup of tea! But their Wasabi tastes really FRESH! Aiyoo... this pic again! I know la.. i love their Salmon.. REALLY! 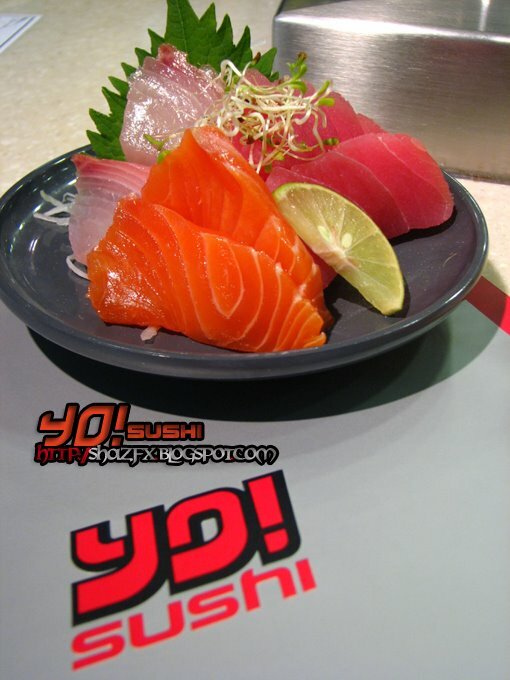 Their range of sashimi really makes my mouth watery now! Here comes the Salmon sashimi again! Look at how fresh it is! Prawns...with light drizzling of mayonnaise on top! 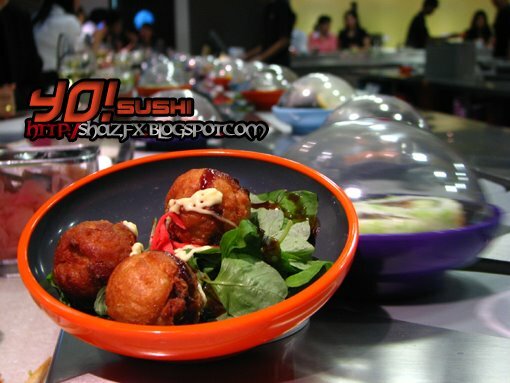 Takoyaki balls...these are delicious aswell! 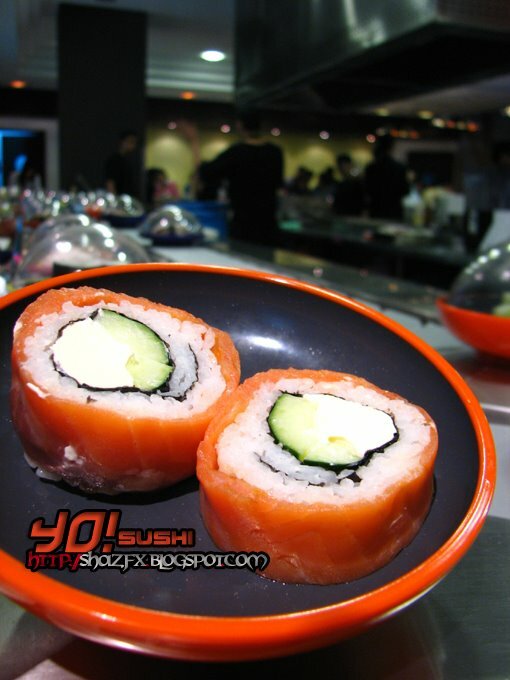 One of their famous dishes as well... salmon roll with cream cheese inside! It melts in your mouth!!! Becareful cheesie!!! Don't get knocked out with this! Three of us here seated on the side of the conveyer belt! Forgotten what it's called in Japanese la... anyone has a clue? 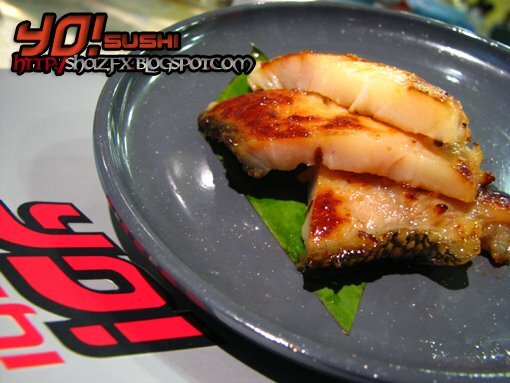 THE ULTIMATE - Miso Black Cod! This is "THE" dish that YOU MUST TRY!!! 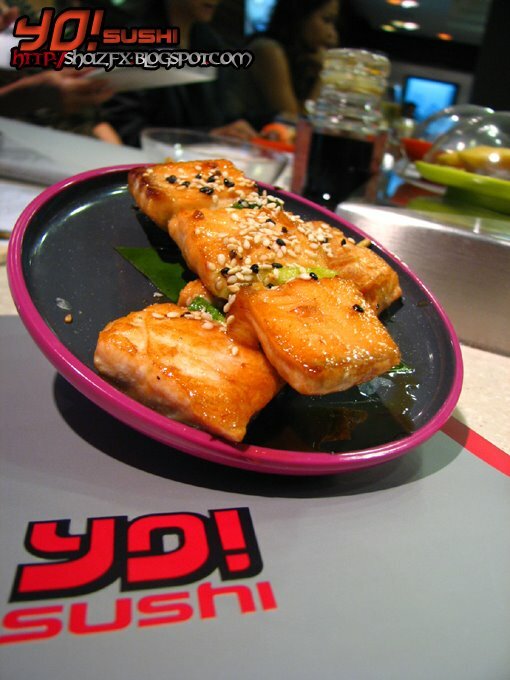 Miso Black Cod is the first thing i order and the last that i order here at YO!Sushi, a must have everytime i come here! the taste...i shall not describe it out to y'all! - JUST GO!!! It's 10 sumthin PM... time for us to leave, everyone else left already! Well... le'ts go HOME! Stomach's full...REALLY FULL! Jessie and Me... She was invited to the event as well.. What a small world, she was my collegemate back in APIIT. 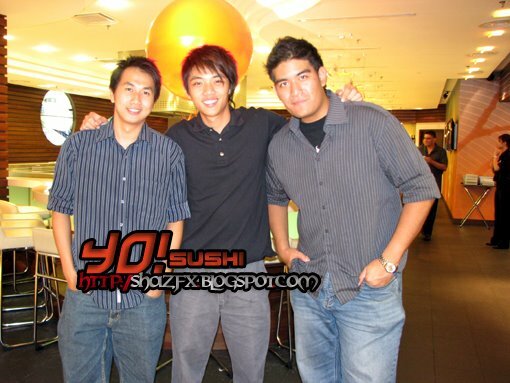 All of us together with the Head Chef of YO!Sushi here in KL, Alex... the guy behind all those yummy food! What's up after main course.. of course the desserts! 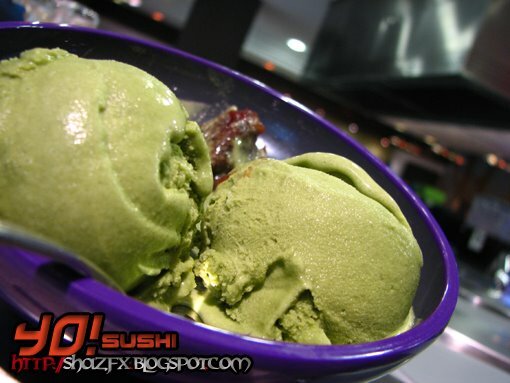 Green Tea ice-cream!!! My favourite la!!! this is a MUST try aswell! - There's so much more for you to try out, come with a friend here and try it all out! Food looks awesome! The taste is so much better than any other restaurants i've tried. 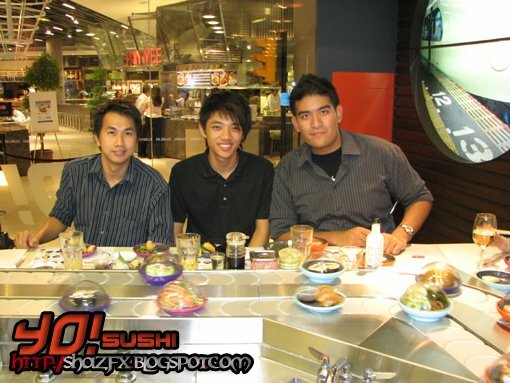 I've eaten at Sushi King, Genki Sushi before... YO!Sushi will be guaranteed to blow your mind! 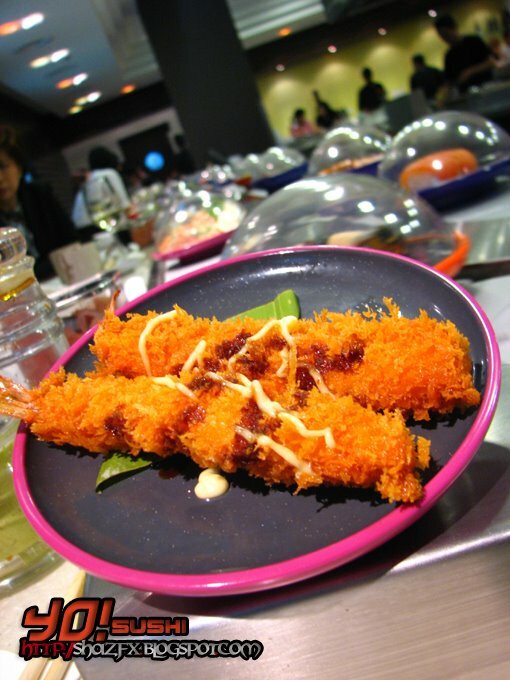 Try it out first and you'll taste a different kind of Japanese food made for you. 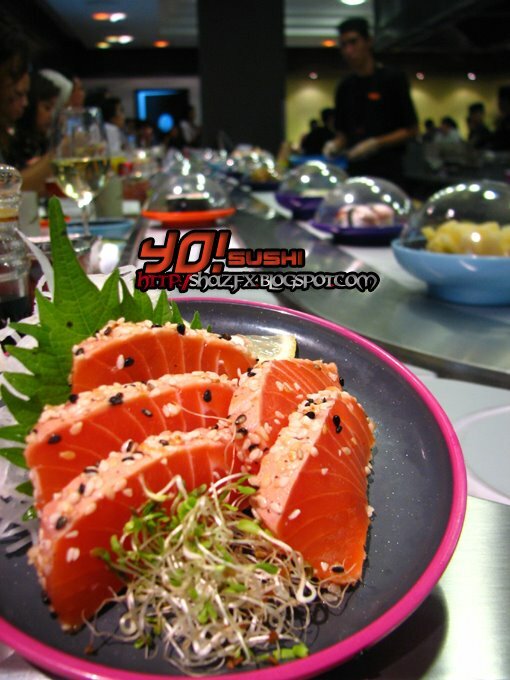 You can't compare YO!Sushi with the restaurants that i just mentioned to you, because YO!Sushi is a level above the rest! Whereby Jogoya, Saisaki are mainly buffet style... Alot of people ask me if its comparable to Sushi Groove. Well let's answer that question here! I've been to Sushi groove a couple of times and the service is kind of slow even during non peak hours. Lots of my friends who went there said the same thing as well. There's nothing to shout about their sushi at sushi groove. The food is just average, price is reasonable for Japanese food yes. 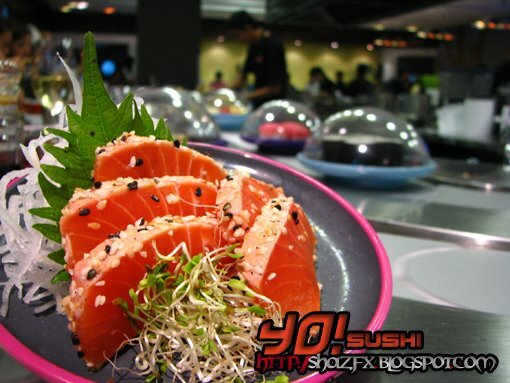 But on the other hand, YO!Sushi is affordable, it is a bit more expensive than the usual Sushi King and Genki Sushi and Ichiban Boshi, but you are paying for the GREAT food, FRESH food that is served to you! Want something of quality, you gotta pay for it! 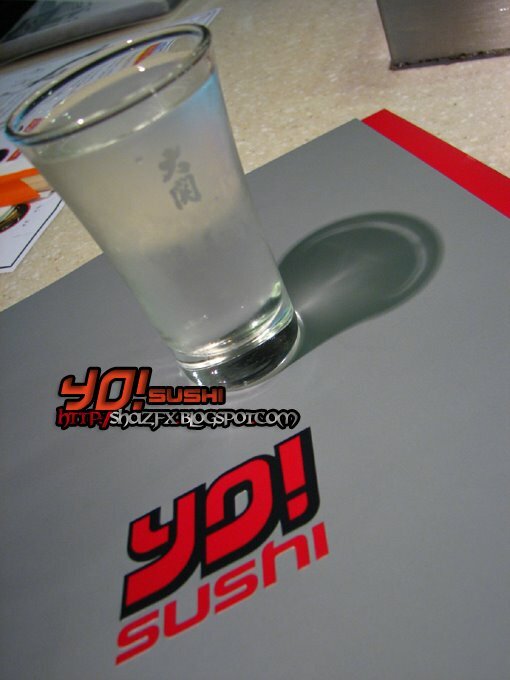 But honestly speaking, YO!Sushi is affordable for the kind of quality food they serve to you! *This is not a paid food review / based solely n the owner of the blog!